"There are two very talented mortals who portrayed the voices for Elisa and Goliath. 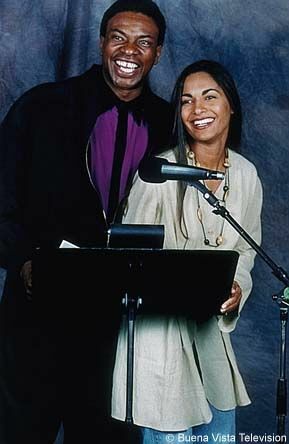 Veteran actor Keith David and actress Salli Richardson. Here you shall find short filmographies and a few pictures of them both." Keith and Salli during voice a recording session. Keith David was born in Harlem, Manhattan, New York City on May 8 1954. Keith's movie credits include movies such as Platoon, The Thing, Armaggedon, There's Something About Mary, Dead Presidents, Pitch Black and the recent Where the Heart is, with Natalie Portman and Ashley Judd. But those listed being only a few of a vast selection of movie, television and theatrical roles credited to this veteran actor's name. Keith is perhaps, however, more famously known for his roles in Disney's Gargoyles, and HBO's Spawn. Born Salli Elise Richardson, Salli's movie credits include A Low Down Dirty Shame, Posse, Sioux City, The Great White Hype and her latest movie, Book of Love. Salli has also had numerous television appearances (Stargate SG-1 as Teal'C's wife) and theatrical roles (even being nominated for an award in such theatrical roles). Salli has a regular role in the new series, Family Law. You can look out for Salli in an upcoming new movie titled Baby of the Family, which is yet to be released (I will keep you posted on when it will be released). If you would like to find more information on either Keith David or Salli Richardson, their complete bios can be found at The International Movie Database.